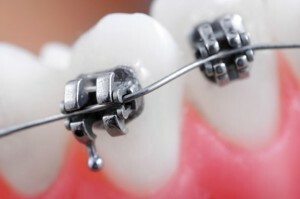 Implants and Orthodontics: Which come first? The answer is an easier one : orthodontics. The reason is that the dental implants are not moveable but teeth are . However how the orthondotics are applied is dependent on the treatment plan and what is to be accomplished. If the overall goal of the treatment plan is to straighten teeth in alignment and then replace a missing tooth, the orthodontics must be done first so the teeth are in correct alignment so that the final position of the implant is in the correct position to replace the missing teeth. If the purpose is not to straighten teeth but to add bone or tissue, orthodontics can be used to move bone and tissue by moving a tooth that will be extracted later. This movement can cause the extra bone and tissue to make the implant placement successful that would not be available before. Comments Off on Implants and Orthodontics: Which come first?